Quickly log and schedule contact history and business related activities with our new Call Logging feature. 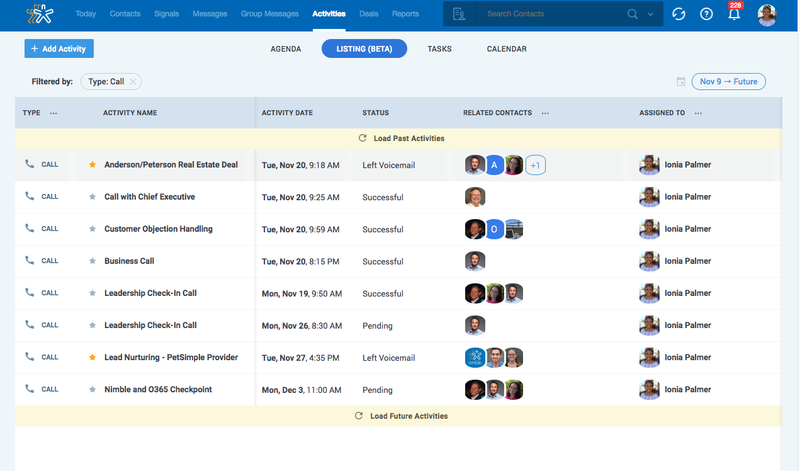 Nimble now offers the ability to schedule and log calls while updating interaction histories to help your business stay on top of follow ups, maintain and improve relationships, and measure your team's success. Our new call logging feature can be found within a contact and deal record as well as within our new Activities Listing (BETA). The Call feature enables you to quickly log and schedule activities related to a contact. This feature includes the ability to schedule a call date/time, log call duration, call resolution, completion date/time, and more. You and your team can log calls from the past, present, and for the future. On a contact record, select "Call" to launch the pop-up window. Call Name - Label your call. Recipient Name(s) - Add contacts that are involved in the call. Phone number - Note the best number to reach your contact(s). Description - Outline the details of your call. Duration (minutes) - Enter duration of the call in minutes. Scheduled Date/Time - Log when your call will take place. Call Resolution - Log the outcome of your call as "successful," "unsuccessful," "abandoned," or "left voicemail." Completed Date/Time - Mark a call as complete and update "Last Contacted Date." Assigned To - Delegate the call to a team member. Related Deals - Associate an existing deal with your call. Tags - Organize your types of calls into groups. Once the call is logged, you will be able to view a list of completed and scheduled activities in the Pending & History tab. When a call is completed as "successful" or "left voicemail," the last contacted date field will update automatically. Calls can also be logged from within a Deal record. To schedule a call, simply go to the Deal Record and select "Add Activity" >> "Call." You can now log a call that will be automatically associated with the deal. You will then be able to view a list of completed and scheduled calls in the "Activities" sub-tab. Our "Activities Listing" is now in BETA. With this feature, you'll be able to see a list of your upcoming, completed, and pending calls. Just visit the "Activities" tab and select "Listing (BETA)." Next to Quick Filters, select "Calls" and Nimble will display a list of your calls by Activity Date. You may also log calls from the Activities Listing by selecting "Add Activity" >> "Call."